The Muslims’ Union of Georgia is demanding the DNA analysis of the remains of 150 corpses discovered at the military base of the West Georgia coastal city Batumi. 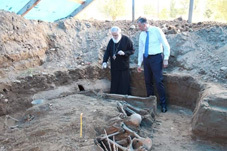 The union commented on the information released by the Batumi and Lazeti diocese that the burial ground of the repressed people in 1937-1938 was discovered in Batumi. 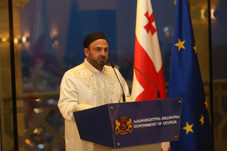 Mufti of the Muslims of Georgia, Beglar Kamashidze says that 600 people were lost during the mentioned period of the Soviet repressions, adding 60-70% of them are Muslims. The Mufti says that the DNA analysis of the discovered 150 remains should be carried out to establish the identity of the deceased. Kamashidze underlined that if the DNA analysis of the corpses cannot be done, Muslims of Georgia will apply to the government and ask for the civil burial of the corps in neutral territory, which will not belong to any religious organization. According to him, the funeral day should not coincide with any of the religious celebrations, and religious symbols or objects should not be used during the ceremony. “It will be very difficult to solve this problem and conduct a DNA analysis of all remains. Therefore, if it is difficult to determine the identity of the deceased, we should bury these people in a neutral cemetery, which does not belong to any religious organization, "said Mufti. Before the statement of the Muslims’ Union, Batumi and Lazeti diocese released a statement saying that on April 21, the civil burial ceremony will be conducted, which will be attended by the representatives of various confessions. “In the future, the state plans to arrange the museum where photos and belongings of these people will be exhibited. There will be erected a memorial and named after the victims in Batumi repressions of 1937-1938. In order to enrich the museum collection we appeal to the relatives of the deceased to give us information and photographs about their dead ancestors, "the statement reads. The diocese also said the excavation process started openly in 2016 and the state agencies were actively involved in it. The released statement reads that with the assistance of the Ministry of Health there will be created a base of the DNA of the remains and examination of the corpses can be done any time. “It should be noted that every skull has a sign of the bullet. There are some women among the victims too. The items discovered in the tomb are the Soviet coins of the 30s of the 20th century. This shows that these remains belong to the Soviet citizens,” the statement added. Last week the Soviet Past Research Laboratory (SovLab) addressed the state authorities and representatives of the Batumi Eparchy to conduct the anthropological-criminal investigation and comprehensive autopsy of 150 corpses. The organization said if these are the remains of the victims of the Soviet period, the State should give this fact a legal framework - to initiate an investigation in a prescribed manner and to ensure that the process is documented. The state has not made any official comment regarding the issue yet.